I've came to the conclusion that my alarm clock no longer cuts it and that I need a wall clock to spice up my room. With that in mind I turned to Etsy knowing it would be a great place to find something unique. What's your favourite? Goldenrod Bird Clock - makingtimetc I really love the intricate pattern around the bird in this clock. I also really like yellow(it's a very happy colour) so I was instantly drawn to this clock. 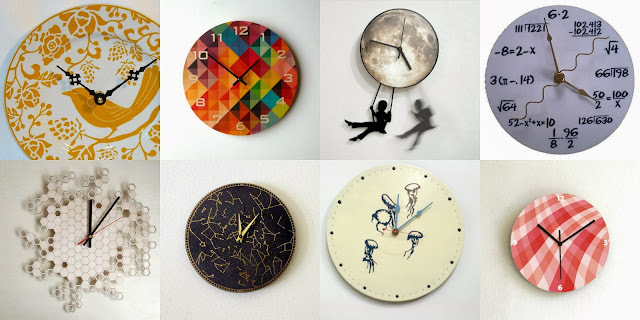 Grid2 Wall Clock - ObjectifyHomeware This is absolutely gorgeous. I really love the combination of the bright colours with the strong geometric print. Pendulum Wall Clock - Object Industrial Art Ok now hold up. This is so damn cool. Just look at it. It needs no explanation. I'd absolutely love this in a hallway or kitchen! Compact Disc Clock - TheGolfingDolphin I am a maths and science geek through and through so I do find this clock to be extremely amusing. It's also made out of an old CD which is really cool. Large Honeycomb Clock - AsymmetreeDesigns There's just something so visually appealing about this one. The inner hipster in me loves it. Constellation Wall Clock - ShannyBeeBo I have to admit that I'm not the biggest astronomy geek. I have absolutely no idea how to find any constellations or the north star or whatever it's called(the big bright one). If I'm honest I don't like to think about stars too much because one day the sun will get so big it engulfs the earth and that makes me feel a little bit faint. I do however really like this clock. It's got a nice little cutesy arty feeling. Pod of Jellyfish Vinyl Wall Clock - LaurelsArt Perfect clock for someone who works in an aquarium. If only I knew someone who works in an aquarium. OH WAIT, THAT'S ME! Pastel Geometric Wall Clock - ArtisEverything This one is actually one of my favourites. I'm not a big fan of pink but I like the way it's been used here.